We invite you to attend the 122nd annual Vermont Library Conference! This year's conference will be held on May 18th from 8:15am to 5:30pm at The Stoweflake Resort in Stowe. When you get to the conference, you're welcome to attend any session you want, even if it's not the one you registered for. Please note that registration for book repair is limited to 15 people. If you would like to attend the book repair workshop, please register for both the conference (a paid ticket) and for the book repair workshop (a free ticket). Those who do not register for the conference will not be admitted to the book repair workshop. View the schedule and program descriptions. We are adding handouts and slides to this page as presenters send them along! 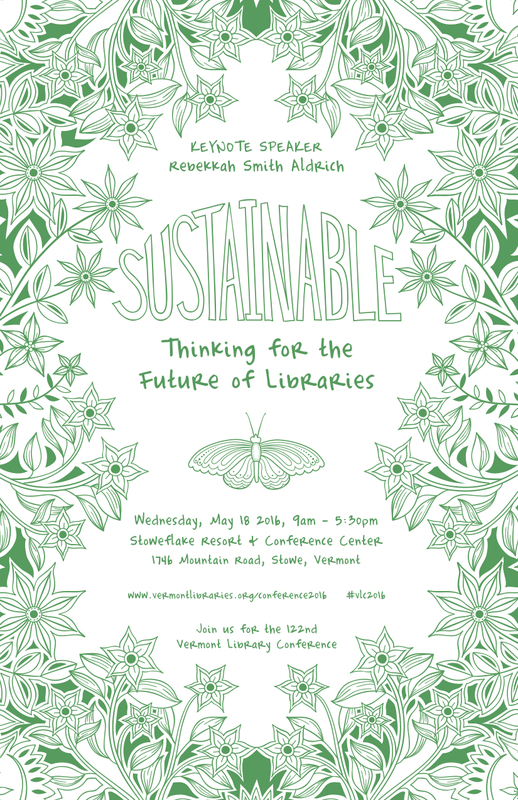 Learn about this year's keynote speaker and hear her speak at 9:30 am on Sustainable Thinking for the Future of Libraries. Visit the Stoweflake Resort and Conference Center website for directions, or get directions from Google to 1746 Mountain Road (Route 108), Stowe, VT 05672. Overnight guests can pull up to the entrance to check in at the front desk and be directed to the closest parking area for your room. Attendees arriving Wednesday morning: parking attendants will direct you along Cape Cod Road, to the right of the building, to parking at the conference center. Once inside, follow signage to registration in the Gallery. Registration is from 8:15 to 9:00 a.m. with refreshments provided. Overnight accommodations at Stoweflake are available by calling 800-253-2232. Please mention the Vermont Library Conference when you make your reservation to receive a discounted rate of $125/night plus tax. Check in at the front desk upon arrival, and you'll be directed to the closest parking area for your room. Interested in vendor space for VLC 2016? Table space is limited and granted on a first come, first serve basis for $150 (plus fees). Vendor table registration includes a full day conference admission for one person and logo placement in the conference brochure. Vendor tables may or may not include electricity. Advertisement space in the brochure and additional tickets for table staff are available by request for a fee. Please contact the conference coordinator for details and a quote for additional services.